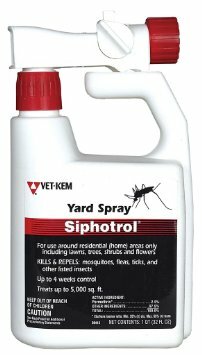 Vet-Kem Siphotrol Yard Spray kills and repels mosquitoes, ticks, fleas, flies, gnats, crickets, ants, bagworms, beetles, cutworms and other flying and crawling insects for up to 4 weeks. Can be used in yards, on trees and bushes, or on outside surfaces of buildings where pests are a problem. It comes with an easy-to-use hose end applicator, or can be mixed and used in hand sprayers. One 32 oz. bottle treats 5,000 sq. ft.
Do not use directly on animals. Keep people and pets off treated areas until dry.